Autograph Letter, signed. To William Hayley Esq. "The character you sustain in the literary world induces me to request your acceptance of the Poem (not present) herewith forwarded to the care of Doct. Price. The cultivation of the arts on this side of the Atlantic has hitherto been attended with very little ... , whether it be most owing to a defect in native genius, or the want of libraries & a Metropolis favourable to the institution ... "
Hartford, Connecticut, 1787. 2 pp. 8vo. About fine, some toning. 2 pp. 8vo. Barlow to Hayley, Student to Mentor. Hayley was a major influence on Barlow and this is a very interesting letter. Essai d'un art de fusion à l'aide de l'air du feu, ou air vital par Mr. Ehrmann (.). Traduit de l'allemand par M. de Fontallard & revu par l'auteur. Suivi des Mémoires de Mr. Lavoisier, sur le même sujet. Paris, 1787. Uniform contemporary calf, spines gilt, leather labels. Some very minor rubbing at extremities. A fresh and especially handsome set. With the bookplate of Nils Rosen in each volume, as well as New York Horticultural Society bookplate on front fly leaf of each volume, noting Kenneth K. Mackenzie's bequest of the book. The first French edition, translated from the original Swedish. Sparrman, a zoologist from the University of Uppsala, was at the Cape when Cook's second expedition arrived, and from 1772 to 1775 he accompanied that party on its famous reconnaissance of the South Pacific. He gives an account of this in the present work. Most of the book is devoted to his experiences in Africa in 1772, 1775, and 1776. An important work of natural history and South Africa material, as well as an interesting account of the Cook expedition. This edition contains a beautiful engraved map of the Cape of Good Hope and sixteen engraved plates of natural history subjects. Philadelphia, 1787. Gathered signatures, stitched as issued. Titlepage and following leaf with paper loss upper outer margin, not affecting text, expertly replaced with matching paper. Old light foxing. Very good. In a half morocco box. An early and important Philadelphia printing of the Constitution, issued just after the Pennsylvania Convention ratified the document on December 12, 1787. This printing was produced some three months after the Constitution was first approved by the Constitutional Convention on September 17, 1787. 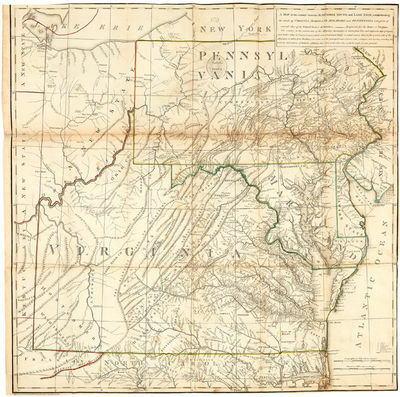 Pennsylvania was a key state in the ratification process - it was the first large state to ratify the Constitution and the second overall, following only Delaware, which ratified it on December 7. Pennsylvania's ratification marked an important step in the process to adoption of the Constitution as the supreme law of the land; this printing therefore marks an auspicious moment on the path to adoption. 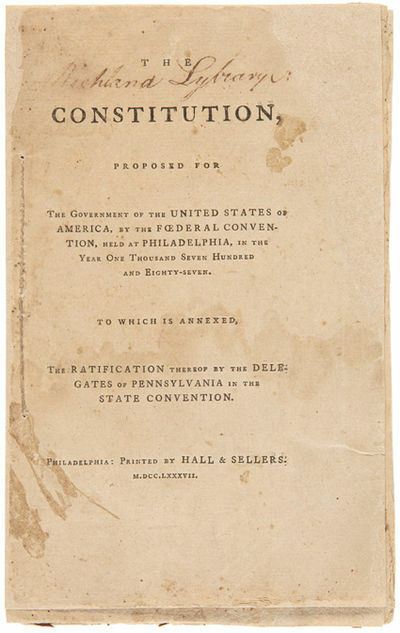 This is one of only a handful of pamphlet printings of the Constitution done in 1787, and also includes, on the final page, the names of the forty-six delegates who voted in favor of the Constitution at the Pennsylvania ratifying convention. This copy bears the early ownership signature of the "Richland Lybrary" on the titlepage. "Very rare in any condition...the importance of this pamphlet is apparent" - Rosenbach (who offered a copy in 1917 for $90). ESTC, NAIP, and OCLC together locate a total of thirteen copies. This is the first copy that we have ever owned, and we cannot find any copy appearing at auction in at least the past forty years. Any 1787 printing of the Constitution is scarce on the market. Memorias de la Colonia Francesa de SANTO DOMINGO, con algunas reflexiones relativas a la ISLA DE CUBA, POR UN VIAGERO ESPAÑOL. Publicalas Don Ignacio Gala. England und Italien (Bde. 1-5) / Annalen der Brittischen Geschichte des Jahres 1788. Als Fortsetzung des Werks England und Italien (Bde. 1-3) / Geschichte des siebenjährigen Krieges in Deutschland (Bde. 1-2). - 10 Bände. Archenholtz, J.W. von: 1-5: England und Italien. Erster, Zweiter, Dritter, Vierter, Fünfter [1 2 3 4 5] Theil (je Vlg. C.G. Schmieder, Karlsruhe 1787; je Ledereinband mit Goldbeschriftung am Rücken, Rotschnitt, 8°, 2. "gänzlich umgearbeitete und beträchtlich vermehrte Ausgabe", 250 und 236 und 436 und 208 und 282 Seiten, je Band mit einem Stich auf Titelseite [alle Einbände etwas berieben, dazu - 1: 3 kleine Wurmlöcher am Rücken oben; 2: dito Einband hinten; 3: Einbanddeckel gewölbt; 4: Einbanddeckel leicht gewölbt; 5: wie 3]); 6: Annalen der Brittischen Geschichte des Jahres 1788. Als Fortsetzung des Werks England und Italien. Erster Band; 7: dito 1789, Zweiter Band; 8: dito 1790, Dritter Band (je Schmieder, Karlsruhe 1790; je Halbledereinbände, 8°, Rotschnitt, Lesebändchen, kein Titelkupfer, 480 und 353 und 368 Seiten. [Einbände etwas berieben und mit Rückenschildchen; 6 mit 3 kl. Wurmlöchern im Block unten bis S. 13 - ohne Textverlust, 7 mit leicht eingedrückten oberen Einbandkanten; 8 mit angeplatzter Kante Rücken/Einbandhinterdeckel (Läsur 2cm)]; 9-10: Geschichte des siebenjährigen Krieges in Deutschland, Erster und Zweiter Band. (Vlg. Haude und Spener, Berlin 1793; je 8°, Halbledereinband, 434 und 453 Seiten, Rotschnitt, Bd. 2 mit einem Kupfer (zeigend Herzog Ferdinand von Braunschweig); beide Einbände leicht berieben und mit schwach gewölbten Deckeln, 2 mit 3 kl. Wurmlöchern im Rücken oben - die auf der Titelseite angegebene "illuminierte Charte" fehlt, wahrscheinlich auch Abbildungen). Alle Bände schwach stockfleckig und mit Besitzervermerk der Zeit. DUNKER (Balthasar Anton) - MERCIER (Louis Sébastien)]. Tableau de Paris, ou Explication de différentes figures, gravées à l'eau-forte, pour servir aux différentes éditions du Tableau de Paris, par M. Mercier. Autograph Letter, signed. To William Hayley Esq. "The character you sustain in the literary world induces me to request your acceptance of the Poem (not present) herewith forwarded to the care of Doct. Price. The cultivation of the arts on this side of the Atlantic has hitherto been attended with very little . , whether it be most owing to a defect in native genius, or the want of libraries & a Metropolis favourable to the institution . " Hartford, Connecticut 1787 - 2 pp. 8vo. Barlow to Hayley, Student to Mentor. Hayley was a major influence on Barlow and this is a very interesting letter. Narrative of an Ascent to the Summit of Mont Blanc on the 8th and 9th August, 1827. London, Longman u. a. 1828. 4°. (III)-IX, (so komplett), 1 Bl., 120 S., mit 19 lithogr. Tafeln (davon 7 auf aufgewalztem China, 2 kolor., eine mehrf. gefalt. ), 2 gefalt. lithogr. Karten (davon eine teilkolor.) und beids. bedrucktem lithogr. Faksimile, Hldr. d. Zt. mit reicher Rvg. u. Rtit. A Strasbourg: chez J.G. Treutel, 1787. Fine. chez J.G. Treutel, A Strasbourg 1787, in 12 (18x10,5cm), 5 f. n. ch. (VIII) 362 pp , 464 pp. , 400 pp. 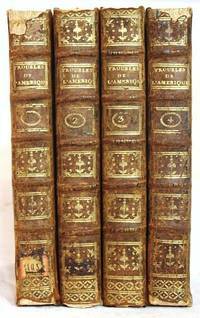 , 410 pp., quatre tomes reliés en quatre volumes. - First edition. 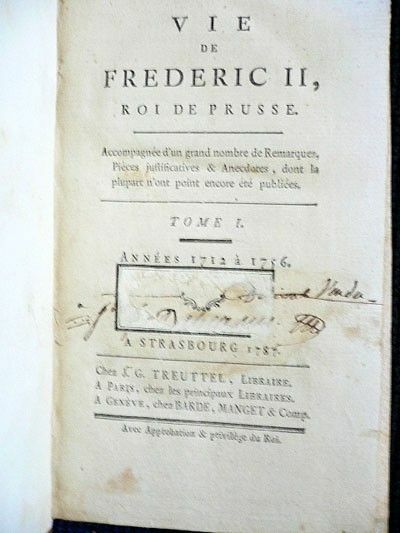 An additional volume will be added in 1788 works of Frederick II. Half brown calf ca 1820 smooth thread back. The first volume covers the contemporary 1712 to 1756, the second from 1756 to 1763, the third deals with the "administration for peace", and the last volume deals with private and literary life and contain many anecdotes. --- Please note that the translation in english is done automatically, we apologize if the formulas are inaccurate. Contact us for any information! - [FRENCH VERSION FOLLOWS] Première édition. Un volume supplémentaire sera ajouté en 1788 des oeuvres de Frédéric II. Reliures en demi veau brun ca 1820, dos lisse à filets. Le premier tome traite de la période 1712 à 1756, le second de 1756 à 1763, le troisième s'occupe de l' »administration pendant la paix », et le dernier volume traite de la vie privée et littéraire et renferment de nombreuses anecdotes. Paris, 1787. 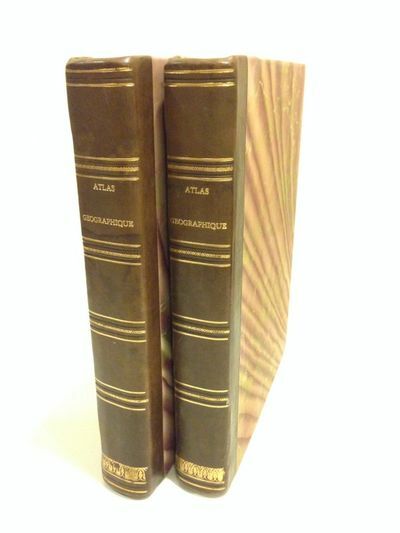 Large folio atlas in antique-style half calf and patterned boards, spine gilt, leather label. Light scattered foxing. 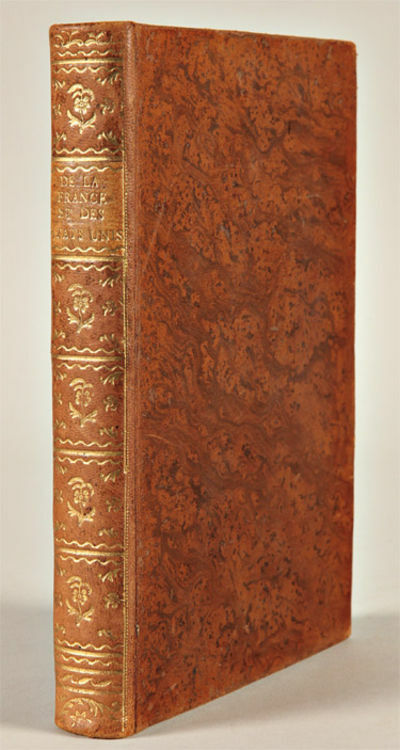 Quarto text volume in contemporary mottled calf, spine gilt, leather label, stamped with the arms of France on both covers. A few scattered spots of foxing. Last ten pages of text lightly browned. A very good set. A rare and beautifully produced atlas recording the results of an official French coastal survey of the island of Hispaniola, with the full complement of seven maps and plates. Only three copies of this rare marine atlas are recorded as having sold at auction in the past thirty years, and all had only six maps and plates. The text starts with an explanation of the methods the Comte de Puységur used during the survey, as well as his acknowledgment of the help given by various individuals (the coastal profiles, for instance, were drawn up from drawings by M. Ozanne, "Ingénieur-constructeur de la Marine"). This introductory text is followed by detailed notes on the observations made of the positions of the various locations used as a base for the construction of the maps, and by notes on the available anchorages around the island. The text finishes with "Détails du mouvement" of marine chronometers number "28" and letter "A" that were used during the survey. The maps and plates are as follows: 1) "Carte réduite de l'Isle de St. Domingue . d'après les observations faites sur la Corvette Vautour en 1784 et 1785." A double-page map of Saint Domingue with four integral coastal profiles at the top. 2) "Carte réduite des débouquements de St. Domingue . d'après les observations faites sur la Corvette Vautour en 1784 et 1785." A double-page sea-chart of the Turks and Caicos Islands and part of the northern coastline of Saint Domingue. 3) "Plan de la Baye de l'Acul; Baye de Dame-Marie; Le Port François; Plan du Môle St. Nicolas; Baye des Irois." 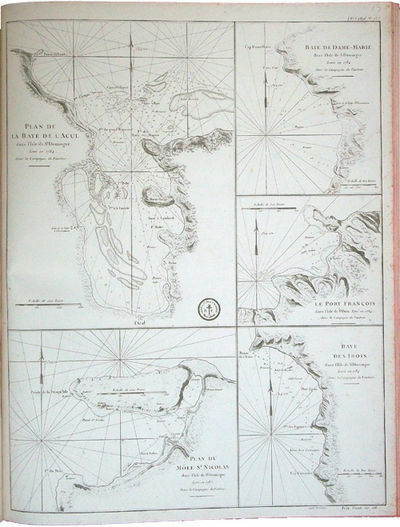 One page with charts of five anchorages on the coast of Hispaniola. 4) "L'Anse a Chouchou; Le Port Paix; Mouillage de Jean- Rabel; La Baye Moustique; Baye de Tiburon; Baye des Gonayves; La Baye du Fond de la Grange; Port a l'Écu; rade de la Basse-Terre." One page with charts of nine anchorages on the coast of Hispaniola. 5) Coastal profiles of seventeen locations on a single page. 6) Coastal profiles of nineteen locations on a single page 7) "Carte De La Gonave dressée sur les opérations géométriques faites en 1787 . par M. de Lieudé de Sepmanville." A double-page sea chart of Gonave Island and the Port Au Prince Bay area. The accompanying text volume gives details for navigating the coasts of the island. Rare, with only seven copies of the atlas and fewer than twenty copies of the accompanying text located in OCLC. A lovely set. Della filosofia della storia. Libri tre dell'Abate Aurelio De' Giorgi Bertola patrizio riminese. London [i.e. Paris?]. 1787.. xxiv,xlviii,344pp. Later roan, spine gilt. Modern bookplate on front pastedown. Negligible foxing. Very good plus. A highly important work of political economy, published in Paris under a false imprint, and designed to stimulate investment in the United States by the French. Brissot de Warville was one of the most pro-American French thinkers of the period; he later wrote a well-known work on his American travels, and finally died in the Terror. This book seeks to enlighten the French and American public about the possibilities for mutually beneficial investments. Dedicated to the American Congress and the "friends of America in both worlds," it reviews a number of economic issues, such as balance of trade, the superior benefits of French manufactures for American markets, why French wines and oils were better than any that could be produced in the U.S., and a broad range of specific products. Various American products ranging from rice to furs are then discussed. In the end the authors include a prospectus for their proposed "Societe Gallo-Americaine." Claviere and Brissot de Warville worked together on a number of political tracts, and both believed that the example of America's fledgling democracy held the key to France's future. HOWES C464. KRESS B1169. GOLDSMITHS 13307. ESTC T109594. SABIN 13516. Havana, 1787. Small quarto. Contemporary mottled calf, spine gilt, leather label. Light wear to extremities, boards slightly scuffed. Minor foxing and soiling. Very good. 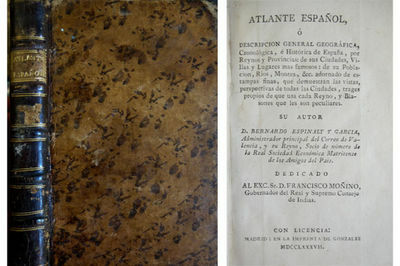 A most important book of Caribbean natural history and an outstanding example of Cuban book printing. In addition to being the first scientific work published in Cuba, Parra's book stands as the first example of Cuban printing illustrated with copper plates, and Trelles goes so far as to call it the first book of any importance published in Cuba. As an example of Caribbean book printing, it is hard to imagine a book of greater interest. The work's status as an early Havana imprint alone makes it important, but the original scientific content combined with the exquisitely detailed engravings make it nothing short of extraordinary. The plates, drawn and engraved by the author's son, Manuel, illustrate all manner of crabs, fish, sponges, corals, etc., discovered by Parra along the Cuban shoreline. Each species is illustrated in conjunction with a physical description. Concerning the lobster, Parra writes: "The meat is edible and most scrumptious with oil and vinegar." The first two folding plates depict elaborate specimen cabinets containing crustaceans and netted fish. The last three plates illustrate an unfortunate black man afflicted with hydrocele. 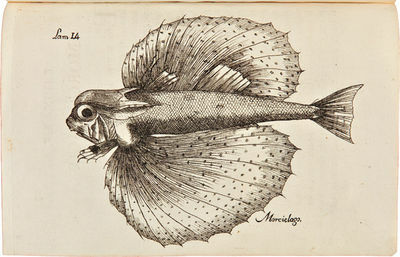 Parra was born in Tavira, Portugal and arrived in Havana in 1766 on commission by the Spanish government to collect specimens for the museum of natural history in Madrid. In addition to the present work, he produced a descriptive catalogue of the fish and crustaceans native to the island, which is also excessively rare. The collation recorded by the NUC, which locates seven copies, is wrong, as is that in Sabin. A magnificent example of early Caribbean book production. Rare. Karsch (Karschin), Anna Luise, Dichterin (1722-1791). Schwedt, 10. X. 1787. - 4 SS. auf gefalt. Doppelblatt. 8vo. Unveröffentlichtes Briefgedicht an die Schriftstellerkollegin Susanne von Bandemer (1751-1828), geschrieben während eines Aufenthalts auf dem von Markgraf Friedrich Heinrich von Brandenburg-Schwedt zur Theaterresidenz ausgebauten Schloß Schwedt in der Uckermark: "Liebe Bandemer, ich ward / überrascht zum Schnelentschluße / meiner Fahrt, / wie ein Mädchen spröder Art / übereilet wird zum Kuße - - / Meine Lieblingssänngerrin / schrieb so herzig, daß ich reisen muste / daß ich Ihr so wahr ich binn / nicht zu wiederstehen wuste / und nun will ihr Eigensinn / mich noch lannge nicht entlaßen / und mir gehts auch hier so gut / daß ich Vorsaz könntte faßen / hier zu sein mit frohen Muth / all mein Lebelang, wenn Kinnder / und die Freunde nach Berlin / mich nicht mächttig könntten ziehn, / wenn mein Hauß nicht ein Gehinder / ann dem großen Vorsaz wär / wenn ich vierzig Sommer zähltte / dann ergäb ich mich hieher / und zu meiner Wohnung wähltte / ich ein Hauß fünf Fennster breit / auf dem Plaze der nicht weit / vom Pallast ist abgelegen / und durch Linden breit und schön / jedem Wanndrer lacht entgegen / auf dem Grase sannft zu gehn / aber daß wird nicht erlaubet / weils dem Grase Schönheit raubet / darum geht man neben bey - / Doch was schwaz ich von den Dingen, / meinen Augen sind sie neu / Dir kanns wenig Freude bringen / daß mir Schwed anmutig sey - / Namen will ich lieber schreiben / die du den Registerlein / deines Buchs solst einverleiben / und alsdann, und alsdann / eile zu dem Odensännger / sage meinen Gruß ihn ann / meinen Wunsch, daß ihm nie bänger / auf der Erde sey als mir / inn des Marggraf Heinrichs Laube / daß er seine Freundschaft dir / Zeit und Neid nicht laße rauben / daß er noch mit Ruhmbegier / neue Hymnen soltte sinngen / wenn ich aufgehört zu sein / aufgehört durch Reimerreyn / Herzen zum Gefhühl zu schwingen" (Federwechsel nach "Heinrichs", Groß- und Kleinschreibung normalisiert). Auf der letzten Seite eine Liste von 14 Personen: neben dem Hausherrn und seiner Frau ("Sr. königliche Hoheit der Marggraf von Schwed" und "Frau Baronesse von Stolzenberg") u. a. "der Herr Hof und Forstraht Lauer", "Frau Generalin und Gräfin von Lottum", "die Frau Gräfin von Dyhren", "der Herr Cammerdirector Solger", "Demoisel Sophia Niclas" etc. (wahrscheinlich weitere Gäste auf Schloß Schwedt). "Schreiben Sie vor der Hand diese dreyzen Namen ein, jedem mit einem Exemplar und leben Sie wohl." - Spuren alter Faltung; sauber und wohlerhalten. London, 1787. Contemporary calf, expertly rebacked. Upper board edges and corners restored, in matching gold tooling. Bookplate on front pastedown, contemporary ink signature on titlepage, map strengthened at folds, else internally very clean and bright. Very good. In a half morocco and cloth box, spine gilt. The first English edition of Jefferson's famous work. This is the only book-length work by Jefferson to be published in his lifetime, and has been called "one of America's first permanent literary and intellectual landmarks." 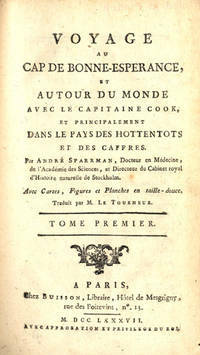 It was largely written in 1781 and first published in Paris, in French, in 1785. Written in the form of answers to questions about Virginia, the book supplies a description of the geography, with an abundance of supporting material and unusual information. As J.M. Edelstein notes: "Jefferson wrote about things which interested him deeply and about which he knew a great deal; the NOTES, therefore, throws a fascinating light on his tastes, curiosities, and political and social opinions." The handsome map which accompanies this edition (but is often lacking), based on the Fry and (Peter) Jefferson map, was not issued with the Paris editions. The story of the creation of this book and its publishing history is an interesting one. It is told fully by Millicent Sowerby in her catalogue of Jefferson's library, where it occupies some thirty pages in small type. Brachmann, Luise, eig. Karoline Marie, Ps. L. Klarfeld, Schriftstellerin (1777-1822). O. O. u. D. - 4 SS. auf Doppelblatt. 8vo. An ein "Jettchen", d. i. Henriette Coeler: "Zwar hab' ich, mein liebes Jettchen, schon vor einigen Wochen meinen warmen, herzlichen Dank für Ihren lieben Brief ausgesprochen [. ]; allein bald muß ich fürchten daß Sie ihn nicht erhalten haben [.] Wie gerne hätte ich Ihnen diese Weihnachten eine kleine Freude gemacht, allein ich kon[n]te es nicht u. muß es mir vorbehalten. Möchte Ihnen doch der Himmel ein so reiches Ihr Herz beglückendes Geschenk geben! [.]". - In Weißenfels, wo sich die Familie der Schriftstellerin 1787 niedergelassen hatte, lernte Luise Brachmann Novalis und dessen Schwester Sidonie von Hardenberg kennen, mit der sie eine enge Freundschaft verband. "Novalis empfahl sie Schiller, der einige ihrer Gedichte in die 'Horen' und die 'Musenalmanache' für 1798 und 1799 aufnahm. 1803 unternahm Brachmann mit ihrem Vater eine Reise nach Weimar und Jena, wo sie von Schiller, Johann Bernhard Vermehren und anderen empfangen wurden. Nach dem Tod ihres Vaters 1804 versuchte sie, von der Schriftstellerei zu leben, und veröffentlichte Gedichte und Erzählungen (Novellen, 1822)" (DBE, Saur). Ständig in finanziellen Problemen und privaten Problemen ausgesetzt, suchte sie "nach einem exzentrischen Leben aus Liebesgram den Tod in der Saale" (Kosch I, 206). Carte topographique de la grande Route de Berne à Zurich & Zurzach avec l'emplacement des pierres milliaires distantes de 1800. Toises de 10. pieds de Berne. Mesure & Gravé par P. Bel., Ing. avec Permission & Privilège exclusif de LLEE. de Berne. Traité de l'Astronomie Indienne et Orientale. Ouvrage qui peut servir de suite à l'histoire de l'astronomie ancienne. London, Edinburgh Strahan; T Cadell; W Creech 1787. VG : in very good condition. Rebound in tooled gilt modern leather binding. Previous owner's bookplate to front pastedown. Previous owner's inscription to upper edge of fep. Portrait frontis cut down and plate laid on blank leaf facing title page. Marbled endpapers. Aeg Third Edition Green hardback leather cover 220mm x 150mm (9" x 6"). 372pp. Hancarville, P.-F. Hugues gen. d'). Monumens du Culte Secret des Dames Romaines. Kst.- Karte, in 4 Blatt v. H. Benedicti n. Robert Vaugondy b. F.A. Schraembl, "Karte von Africa .". - mit altem Grenzkolorit, dat. 1787, ( zusammensetzbar auf 96 x 108 cm.) Dekorative Wandkarte von Afrika. Oben rechts eine dek. Titelkartusche, unten links Erklärungen.- Large map of Afrika. In the upper right corner a large cartouche in ornate framework. Original outline colour. 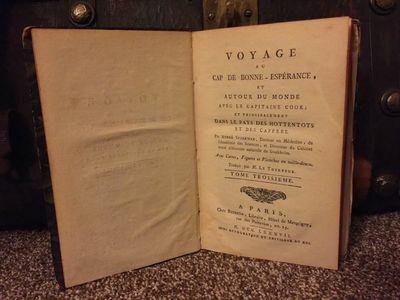 Voyage en Pologne, Russie, Suède, Danemarck, &c. Traduit de l?anglais, enrichi de notes et des éclaircissemens nécessaires, & augmenté d?un Voyage en Norvège par Mr. P. H. Mallet? En 4 volumes. The History of Scotland During the Reigns of Queen Mary and King James VI. Till his accession to the Crown of England. The Eleventh Edition, with emendations and additions. A View of the Earth : Being a short but comprehensive System of Modern Geography. Frauenkopf im Dreiviertelprofil nach rechts. - Rote Kreide, auf Bütten mit Wasserzeichen: D & C Blauw, rechts unten signiert und datiert &#132;Schmuzer fec 1787" (verwischt und nur noch schwach sichtbar). 50,5:36,8 cm. Papier insgesamt leicht angeschmutzt, mit kleineren Restaurierungen in den Rändern. Vergleichsliteratur: Ausst. Katalog: Österreichische Zeichnung des 18. Jahrhunderts: Ausgewählte Werke aus böhmischen und mährischen Sammlungen. Bearb. von P. Preiss, Prag 1996, Nr. 57, Abb. S 110. Der Sohn von Andreas Schmutzer (1700-1740) war zunächst Schüler der Wiener Akademie, später J.I. Mildorfers (1719 &#150; nach 1756). Es folgte ein kurzer Aufenthalt in Preßburg, danach die Übersiedlung nach Wien. Hier wurde er Zeichenhilfslehrer am Emanuel-Savoyschen Institut. 1762 unternahm er eine Studienreise nach Paris, wo er an der Akademie und ebenso bei J.Gg. Wille (1715-1808) tätig war. 1766 folgte die Berufung nach Wien als Hofkupferstecher, 1771 die Ernennung zum Oberdirektor der erbländischen Normalzeichenschulen und auch als Direktor der Wiener Akademie, wo er die Kupferstichklasse führte. Darüber hinaus war er Mitglied der Akademien in Berlin, Dresden sowie Kopenhagen und Petersburg. Zeichnungen von Schmutzer befinden sich in Wien in der Akademie der bildenden Künste und in der Albertina, in der Graphischen Sammlung von Stift Lambach, in den Kupferstichkabinetten der Museen in Budapest, Berlin, Dresden, München etc. Friedrich II., der Große (Berlin 24. 01. 1712 - 17. 08. 1786 in Potsdam). "Frederic le Grand, retournant a Sans-Souci a pres les manoeuvres de Potsdam accompagne de Ses Generaux. - Dedie et presente par permission a Frederic Guillaume II. Protecteur des beaux arts en Prusse". Ganzportrait des alten Königs zu Pferde mit seinen Generalen vor Potsdam.
. Kupferstich v. Clemens n. E.F. Cunningham, 1787, 57 x 85,5. v. Campe (Ergänzung) 553. - Zeigt Friedrich den Großen mit seinen Generalen und anderen wichtigen Persönlichkeiten, darunter die späteren Könige Friedrich Wilhelm II und Friedrich Wilhelm III, die Generale de Lafayette, Ziethen, von Möllendorf, von Prittwitz und den Herzog von York. - Dekoratives und seltenes Blatt. Paris: Hôtel de Thou, 1787-1788. First edition. 4to. Two volumes: 65 pp., tables 77 engraved maps, mostly double-page, four with hand-colored outline; 110, (2) pp., 63 engraved maps (numbered 78-14), mostly double-page. Includes 22 maps of the Western Hemisphere and 12 maps of the Pacific islands. Recent quarter-calf and marbled boards, gilt spine title; old tideline in first two leaves of volume one, some marginal worming in each volume, not affecting text, a little interior soiling. Still a very good copy in sturdy new bindings. Roma, Giovanni Zempel, 1787. xvi, 271 p., 2 maps (one folding); 29 cm. Bound with his Lettera dell' autore delle memorie Albane al cittadino Emmanuele Lucidi canonico dell' Ariccla ed autore delle memorie Aricine, Roma, A. Fulgoni, 1798, 1 preliminary leaf, 38 p.; 28 cm. Lozzi 32 (V. 1, p. 110). Very Good in vellum spine and marbled paper over boards. Stock#OB1045. London: Printed for Hooper & Wigstead. No. 212 High-Holborn, [n.d. circa 1787]. â€œNew editionâ€. 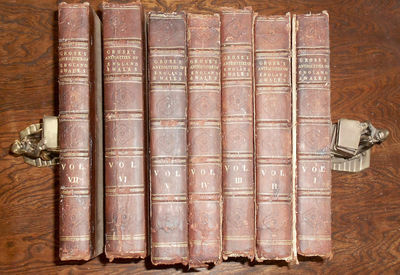 seven of the volumes in three-quarter brown morocco over boards, spines with raised bands and lettered in gilt; volume VIII rebacked with modern brown smooth calf and with new endpapers. Bindings worn, volume I front covers detached (but present), hinges on several other volumes weak, all covers dust soiled, a few additionally with spot marks, interiors slightly foxed in places but overall very nice. Quarto. Eight volumes; the last being Supplement which includes the islands of Guernsey and Jersey Profusely illustrated with full page engravings of castles, monasteries, architectural drawings and maps. The frontispiece in volume VIII is a portrait of Grose With the bookplate of Mary Macmillin Norton in each volume â€œIllustrative accounts of both [general history of ancient castles and terms relative to their construction etc.] are therefore here given, compiled from the best authorities; and as most of these buildings are either of the Saxon architecture, or of that stile commonly called Gothic ... Domesday-book being quoted in several descriptions ... In order to render every article as clear as possible, the verbal descriptions, where capable, are illustrated by drawings.â€ - from introduction. Francis Grose (1731 - 1791) was an eminent English antiquary. His father had secured a position in the College of Arms which he left in 1763. He has been left in comfortable circumstances by his father but entered into the Surrey militia of which he became an adjutant and paymaster. However, his lifestyle was such that he quickly found himself without funds. He had a talent for drawing and undertook a work which was published over a period of years, and quickly became very successful, â€œViews of Antiquities in England and Walesâ€ begun in 1773. He kept adding volumes to it and the islands of Guernsey and Jersey were completed in 1787 . La police de Paris dévoilée. Madrid, en la Imprenta de González, 1787. 4to. menor; 310 pp. Con dos láminas plegadas, Úbeda y Alcalá la Real, grabadas por Palomino. Encuadernación de la época en piel con tejuelo. Reflex?es sobre as usuras do mutuo Contra a DissertaÁ?o Theologico-Juridica, e o Discurso Politico de hum anonymo a respeito dos juros do dinheiro, Que em huma Carta offerece a hum seu amigo. Catechism- Arabic - Roman Rite]. [Rome], Propaganda Fide, 1786 [= 1787]-1787. - 2 volumes. 8vo. The pages progress from right to left like a normal Arabic book. With an Arabic title-page on the second page of each volume, each with the Propaganda Fide's woodcut Jesus and apostles device and each preceded (on the back of the same leaf) by a Latin half-title. Further with woodcut tail-pieces, 1 woodcut decorated initial, and tailpieces and factotums built up from cast fleurons. Set in 2 sizes of nashk Arabic type, with the 13-page dedication to Pope Pius VI and a few other preliminary pages also in Latin on the facing pages, set in roman and italic type. , "976" [= 980]; , "855" [= 847], [1 blank] pp. Early 19th-century half sheepskin parchment, sewn on recessed cords with a hollow back, hand-lettered spine titles, shell-marbled sides, brown sprinkled edges. First unabridged Arabic edition of the catechism translated from the Latin version authorized by the Council of Trent and the most extensive Arabic catechism ever published, comprising 1827 pages plus preliminaries. It follows the Roman Catholic rite and was printed and published by the Propaganda Fide in Rome. It is based on the Latin text authorized by the Council of Trent under Pope Pius V, first published in Latin in 1566. While some small Arabic catechisms of a few dozen pages had been printed as early as 1580, only a few more extensive ones had appeared, with Bellarmino's growing from 86 pages (not including the parallel Latin text) in 1613 to 411 pages in 1770 and De Beauvais and Richelieu's 1640 Paris edition comprising 415 pages. The present edition is probably the most extensive Arabic work that the Propaganda Fide ever published. Volume 1 is dated 1786 on the Latin half-title and it may have been issued without the dedication (quires *-2*) in that year, but the dedication is dated 22 December 1787 and volume 2 is dated 1787 on the half-title. The Vatican established the Propaganda Fide in 1622 to promote Catholic missionary work, especially in the Middle and Near East, and it set up its own printing office in Rome in 1626. The printing office acquired many types for exotic languages from various earlier Roman printing offices that had operated under the authority of or in close cooperation with the Vatican and also had many new types cut for them, mostly by their own in-house punchcutters. In this way they assembled what was probably the largest collection of exotic printing types in the world, most of them exclusive to their press. The press had declined in the 18th-century, but began to flourish again when the future cardinal Sefano Borgia took chage of the Propaganda Fide and Giovanni Cristoforo Amaduzzi of the press in 1770. The type used for the main text of the present catechism was cut for the Propaganda Fide, probably in-house, and first used for Tommaso Obizzino, Thesaurus Arabico-Syro-Latina, 1636. With a nineteenth-century library stamp, apparently from the Propaganda Fide's own college, in the unprinted areas on both Arabic title-pages (only partly legible, but apparently reading "Pont. Univ. de Propaganda Fide"). With occasional minor and mostly marginal foxing and an occasional quire slightly browned, but otherwise in very good condition, with only an occasional tiny hole or small marginal chip. Only slightly trimmed, preserving an occasional deckle. The most ambitious Arabic catechism produced to this date. Schnurrer 308; WorldCat (2 copies); not in Smitskamp, Philologia orientalis. 1787. Signed. 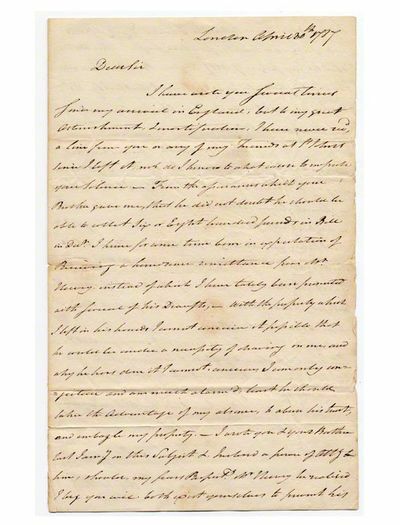 ARNOLD, Benedict.Autograph letter signed.London, April 30, 1787.Outstanding two-page autograph letter, dated 1787, from Benedict Arnold to his Canadian fiduciary, James Hayt, rebuking him over the mishandling of Arnold? 's property and instructing him to make immediate preparations in St. John, New Brunswick, for the arrival of Arnold and his family from London, written and signed by Benedict Arnold.In this scathing letter, Arnold rebukes James Hayt for the mishandling of his property of his property in St. John, New Brunswick. After Arnold committed his infamous acts of treason during the Revolutionary War, he fled to England. However, instead of being hailed as a hero, he was accorded neither acclaim nor position. Wracked by disappointment, he decided to move to Canada. This letter concerns James Hayt? 's failure to take care of Arnold? 's Canadian estate and to adequately prepare for Arnold? 's imminent arrival in St. John.The letter, which is addressed on the last page to Mr. James Hayt of St. Johns[sic], New Brunswick and which bears a return address of General Arnold, London, is written entirely in Arnold? 's hand on the first two pages of the folded sheet. It reads: ? "London, April 20th, 1787, Dear Sir, I have wrote you several times since my arrival in England, but to my great astonishment, & mortification, I have never read a line from you or any of my other friends at St. Johns since I left it, nor do I know to what cause to impute your Silence. From the assurances which your brother gave me, that he did not doubt he should be able to collect Six or Eight hundred pounds in Bill in Debt I have for some time been in expectation of Receiving a handsome remittance from Mr. Henry, instead of which I have lately been presented with several of his Draufts, — With the property which I left in his hands I cannot consider it possible that he would be under a necessity of drawing on me, and why he has done it I cannot conceive. I can only conjecture and am much alarmed, lest he should take this advantage of my absence, to abuse his trust, and embezzle my property. — I wrote you and your Brother but I am on this subject and inclosed a power of Atty to him should my fears Respectg. Mr. Henry be realized. I beg you will both put yourselves to prevent his Injuring me, and take the Charge of my Affairs into your own hands, for which purpose, this letter, should my power of Atty to your Brother have miscarried, shall be your sufficient authority, & I make no doubt will answer the purpose until my Arrival at St. Johns. — The ship which I have chartered is near loaded. I expect to Embark in Eight or nine days, for St. Johns, with my family, I took the liberty in several former letters to request you would be so good as to Assist Mr. Henry in procuring me the largest & best house you could get for their reception, which I now repeat, lest those letters should have miscarried, I wish the House to be ready by the Middle of June, & engaged for 16 to 18 months, by the end of which time I hope to have one built, — I shall bring out a very general & handsome assortment of good, & have some proposals to make to you when I come out which may be to our mutual advantage — Pray present my Compl. to all enquiring Friends… B. Arnold.? "Although Arnold did eventually arrive in St. John and become engaged in the mercantile trades and lumber industry, he was not a success. Even there, he failed to find any sort of warm welcome. In 1791, he returned permanently to London. This letter seems to foreshadow the difficulties Arnold would face in Canada and, indeed, for the rest of his life.Text exceptionally clear and fine, original crease marks, a few small open tears to rear leaf not affecting text (from seal removal), a few spots of embrowning. An exceptional autograph letter in near-fine condition. Quite scarce and desirable. Leiden des jungen Werther. Angebunden: Leopold Friedrich Günther von Göckingk: Lieder zweier Liebenden. 3. verbesserte Ausgabe. (Leipzig, Weidmann, 1819). 2. Einzeldruck der 2. Fassung von 1787 (Goethe). 2 Titel in 1 Band. Leipzig, Georg Joachim Göschen (Goethe), 1787.. Titel, 196 S. (Goethe), 158 S. (Goeckingk). 8°, blauer Pappband um 1820 mit Rückenschild.. Einband etwas berieben und bestoßen; Kapitale mit kleinen Bezugsfehlstellen (jeweils ca. 0,5 cm) und oberes Kapital auch mit winziger Fehlstelle; Ecken und Kanten mit kleinen Bezugsfehlstellen; 1. Titel (Werther) stockfleckig und etwas gebräunt sowie teils auch braunfleckig; 2. Titel (Goeckingk) stock- und braunfleckig; Wappenexlibris (Radierung) "Hollatius" auf dem vorderen Innendeckel. Zum Werther: Einzeldruck aus dem 1. Band der "geringeren" Ausgabe der "Schriften" (= Ausgabe S² nach Hagen) aus dem Jahr 1787 (zu diesem 4-bändigen Nachdruck Göschens von Goethes Schriften vgl. Hagen I, 12 bzw. Goedeke IV/3, 4); Ausgabe ohne Komma hinter "Göschen" auf dem Titel und mit durchgehender Bogennorm "Goethe's W. I. Band." (A, B, C etc.) - hier eine Variante ohne gest. Titelvignette, die Hagen nicht aufführt (Hagen kennt nur Ausgaben mit Vignette). Vgl. Hagen II, 99 (D 5); Goedeke IV/3, 164.A.2.s.. Zu Goeckingk: Goedeke IV/1, 970.7; WG², 19. 1787. Contemporary paste-paper boards. Good. Sparrman, Anders. Voyage au Cap de Bonne-Esperance et autour du Monde avec le Capitaine Cook, et principalement dans le Pays des Hottentots et des Caffres. 16 folding engraved plates; folding map. xxxii, 388; , 366, ; , 363 pages, including half-titles. 3 volumes. 8vo, 191x117 mm, contemporary paste-paper boards, spines and joints worn; occasional heavy browning of text, dampstaining in blank upper and lower margins of plates in Volume 2, and in lower inner corners of opening leaves and map in Volume 3, small tear middle left of map at fold; most pages clean and nice. Overall a fairly nice set - compare at $1200 - $1700 for similar sets! Paris: Buisson, 1787. First octavo edition in French, published the same year as a 2-volume quarto edition. "Sparrman was a Swedish naturalist who accompanied Captain Cook on his second voyage. This work is mainly concerned with his travels and natural history expeditions in South Africa"--Hill, page 279 (1785 edition in English). Beddie 1280 (this edition). Winterlandschaft mit Schlittschuhläufern (Ölgemälde auf Platte). 19. Jahrhundert. Ölgemälde auf Holzplatte; Format: 43,3 x 35,2 cm. Der hochwertige Barockrahmen (Torrigiani Altgold, Rahmenbreite: ca. 5 cm) wurde eigens für das Bild angefertigt. Das Gemälde zeigt eine niederländische, von Schnee- und Eisflächen bedeckte Winterlandschaft, in der sich mehrere Personen, einige von ihnen augenscheinlich auf Schlittschuhen, bewegen. Im rechten Bildbereich ist ein reetgedecktes Bauerngehöft zu sehen. Das dürre Geäst mehrerer Bäume unterstreicht die Kargheit der Landschaft. Ein rückseitiger Galerieaufkleber weist das Gemälde als Werk des niederländischen Malers Andreas Schelfhout (1787 - 1870) aus und beschreibt das Bild zusätzlich mit folgendem Text: "Hiver - De nombreux . circulent sur une riviere prise par la glace. A gauche une barque a moitie echouee sur le bord; de l'autre cote le batiments d'une ferme entoureede quelques grands arbres." Schelfhout, ein Schüler des Theatermalters Johannes Breckenheimer, spezialisierte sich früh auf Landschaftsmalerei. Bevorzugte Motive wurden niederländische Winterlandschaften, die Schelfhout in zumeist kleinformatigen Gemälden abbildete (im Niederländischen gibt es für diese Bilder den Begriff "Schelfhoutjes"). Schelfhouts Bilder sind vor allem in Niederländischen Museen (Amsterdam, Haarlem, Rotterdam), aber auch in Brüssel, London und Frankfurt (Städel) anzutreffen. Schelfhouts Gemälde und Aquarelle sind zum Teil hochdotiert und werden in zahlreichen europäischen Auktionshäusern gehandelt, unter anderem bei Christie's Amsterdam, wo sein Werk "An extensive winter landscape with skaters and a horse-drawn sledge" im November 2014 für USD 211.000 den Besitzer wechselte; sein kleinformatiges Gemälde "A winter landscape with skaters on a frozen waterway" fand am selben Tag zum Zuschlagpreis von USD 34.000 ein neues Zuhause. Trotz der rückseitigen Zuschreibung und obwohl das Bild von Motiv und Darstellung her perfekt in das Werk Andreas Schelfhouts paßt und große motivische Ähnlichkeiten zu anderen Werken des Malers aufweist, ist nicht sicher, ob es sich tatsächlich um ein Werk dieses Malers (oder aber um die Arbeit eines Nachahmers oder Kopisten handelt). Es wird daher nur als zugeschriebenes Werk angeboten.. Das Gemälde weist deutliche Abplatzungen und Bereibungen auf, insbesondere an den Rändern, aber teilweise auch auf der Fläche des Bildes. Es ist somit an sich restaurierungsbedürftig, beweist aber auch im vorhandenen Zustand noch seinen Charme. Die Kosten für eine komplette Restaurierung lägen nach Auskunft einer Kieler Restaurierungswerkstatt im Preisbereich zwischen EUR 500 und EUR 700. Weitere Fotos auf der Homepage des Antiquariats (bitte Art.-Nr. auf der Angebotsseite in das Suchfeld eingeben). Paris : Buisson, 1787-01-01. 2nd. Hardcover. Good. 4 volume set. Full contemporary French leather binding. Gilt stamping to spine, 5 raised bands. Minor chips/shelf wear to spine crown/tail. Marbled end pages. All edges red. Collated. Vol I: , 379, ads -6, blank  pp. Vol II: , 365, blank  pp. Vol III: , 420 pp. Vol IV: , 272, 43 pp. Lacks all maps. Toning. Sabin 87290; Howes S770. Goldsmiths'-Kress no. 13424.1. A contemporary French account of rhe history of the American revolution. In its completed form the best French history of this war; Rochambeau aided in its preparation - Howes. 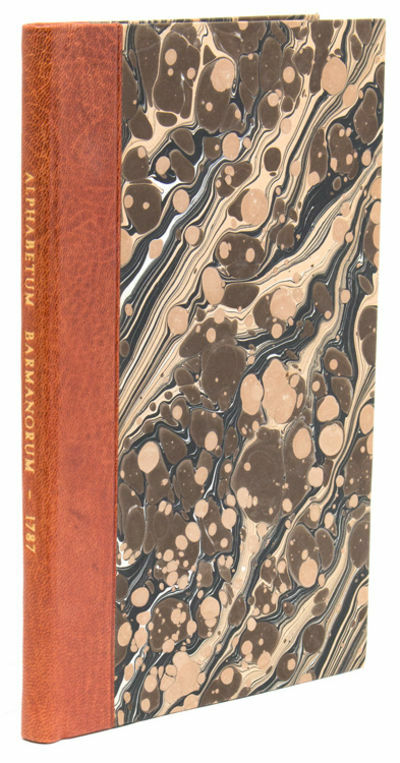 Printed for J. Buckland, and others, 1787-1789, Hardcover, Book Condition: Fair only, Text blocks are clean and solid, with uniform aging and all have matching marbled endpapers, most have one of two type of Richard Curson, Juniors oval bookplate as noted in the detailed description. Still an impressive, if ... (Truncated), First. Condition: Fair only, Text blocks are clean and solid, with uniform aging and all have matching marbled endpapers, most have one of two type of Richard Curson, Juniors oval bookplate as noted in the detailed description. Still an impressive, if incomplete run of these first editions.. Brown, full leather with gilt tooling around edges of covers and dentils inside cover edges. Many covers off, all spines have lost all traces of lettering and titling. Includes Vol. 1 (1787, with engraved frontispiece, ffep torn out, 602 pp, followed by 15 pp. index and 1 pp. errata, front cover off, rear cover barely holding on); Volume 3 (1787, The Lives of The Most Eminent English Poets continued., 418 pp., both covers attached but with weak hinges BOOKPLATE); Volume 4 (1787, The Lives of The Most Eminent English Poets continued, 637 pp., front cover and ffep off and rear cover on but weak BOOKPLATE); Volume 5 (1787, The Rambler, 3 pp. Contents, errata, 446 pp., cover attached but hinges weak, BOOKPLATE); Volume 6 (1787, Continuation of The Rambler, 3 pp. Contents, 443 pp., covers attached but hinges weak, BOOKPLATE); Volume 8 (1787, The Idler, 3 pp. COntents, 410 pp., covers attached but weak); Volume 9 (1787, The Adventurer (and) Philological Tracts, 2 pp. Contents, 446 pp., covers attached, BOOKPLATE); Volume 11 (1787, Tales and Visions. A History of Rasselas, Prince of Abissinia (and) Poems (and) Miscellaneous Poems, 4 p[p. Contents, 430 pp. followed by 90 pp. of Index and Errata in Index, covers strong VARIANT BOOKPLATE); Volume 12 (1787, printed for John Stockdale, xv, (1), Contents, References to The Speakers, 394 pp., covers on, VARIANT BOOKPLATE); Volume 13 (1787, Debates in Parliament in Two Volumes, Volume 2, printed for John Stockdale , COntents, References to Speakers, 516 pp., covers on but hinges weak, VARIANT BOOKPLATE); Volume 14 (1788, printed for John Stockdale and G.G.J. and J. Robinson, 4 pp. Preface, 5 pp. Contents, 556 pp., followed by 2 pp. list of New Books printed for John Stockdale, covers on, BOOKPLATE)) An incomplate but important set. Volume 12, though not noted within, is Volume 1 of the Debates in Parliament. Beginning with Volume 12, there is also a change in "printed for" notation. Most of these volumes contain the bookplate of "Richard Curson, jun." and it is presumed that he is the same individual refered to in this text, found in a blogspot relating to Elizabeth Becker Curson (who was born in New York City in 1731): "Elizabeth Becker's final living son, Richard Curson, Jr., was born on 1763 in New York, and fled to Baltimore, in 1777, with his parents. In 1784, he married Elizabeth Moale, had 3 children who lived to maturity, and lived at his parents' home until 1803. Elizabeth had worried about this son Richard for years. He was in ailing health and suffered from a spinal disease since early childhood. In 1787, Elizabeth Becker Curson died and was buried at Old Saint Paul's Episcopal Church Cemetery in Baltimore. In 1805, Richard Curson Sr. died and was buried next to his wife. The following year, their son Richard was declared a lunatic by the Chancery Court of Maryland. The custody of his person & property were given to Samuel Vincent, who had administered the estate for the elder Curson and his wife, Elizabeth Becker Curson. Richard Jr. died on June 14, 1808, and was buried next to his parents in Baltimore." à Paris: Chez Buisson, 1787. Fine. Chez Buisson, à Paris 1787, in-8 (12,5x20cm), viij ; 422pp. et (4) iv ; 526pp. et (4) 420pp. et (4) iv ; 384pp. et (4) 466pp. 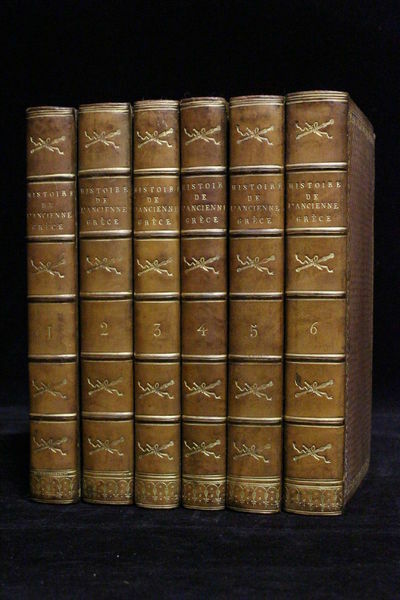 et viij ; 507pp., 6 tomes en 6 volumes reliés. - Binding post (XIX) signed Bozérian Young, back with five nerves decorated with lace, dotted lines, nets and gilded florets. Squared cold boards and framed with golden lace. Net gilded on the cuts. All edges gilt. Golden Roulette coaching contreplats. - [FRENCH VERSION FOLLOWS] Edition ornée de deux grandes cartes dépliantes au tome I. Traduction par Carra. Reliure postérieurs (XIXème) signée Bozérian Jeune, dos à cinq nerfs ornés de dentelles, pointillés, filets et fleurons dorés. Plats quadrillés à froid et encadrés d'une dentelle dorée. Filet doré sur les coupes. Toutes tranches dorées. Roulette dorée en encadrement des contreplats. Quelques épidermures, sinon bel exemplaire. La préface du traducteur résume on ne peut mieux le contenu général de cet ouvrage : "Cette histoire commence avec l'enfance de la Grèce, & décrit la marche progressive & combinée des différentes peuplades de cette contrée vers la civilisation et la politique." L'étude couvre 7 siècles, depuis l'installation des premiers ioniens en asie mineure jusqu'à l'empire d'orient des Macédoniens. L'auteur mêle à la fois les productions dans les arts et la littérature et l'histoire des gouvernements et des guerres.